Well Southern California is on fire again, as it so frequently is, and this time there’s so much flames and smoke you can actually see it from space. When these blazes race through California counties due to low moisture and high winds, the obvious priority is to get everyone out- safel- as fast as humanly possible. Sadly that sometimes means a pet that got spooked and hid gets left behind. You might have seen the globally viral video yesterday of the kid stopping his car on front of a wall of fire to get out and save an injured rabbit. 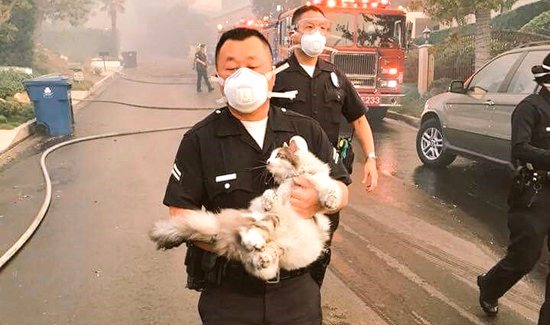 And an LAPD officer is also racking up the views and clicks after he managed to save a rather large house cat that sure would have perished. The best part is you can clearly see the cat’s gratitude and appreciation as he or she’s carried to safety.